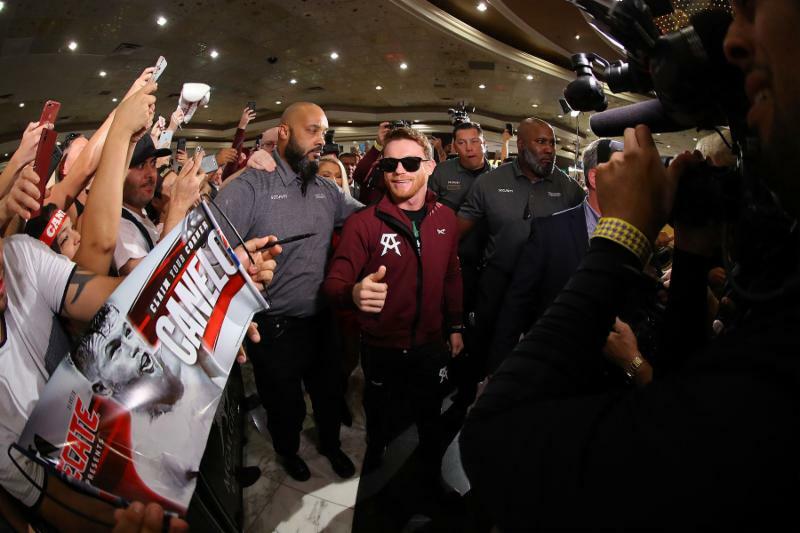 LAS VEGAS (Sept. 11, 2018) - Lineal Middleweight World Champion Canelo Alvarez(49-1-2, 34 KOs) and WBC/WBA/IBO Middleweight Champion Gennady "GGG" Golovkin (38-0-1, 34 KOs) made their grand arrivals today at the MGM Grand Resort and Casino in Las Vegas ahead of their highly anticipated rematch on Sept. 15 at T-Mobile Arena, produced and distributed live by HBO Pay-Per-View® beginning at the special time of 8:00 p.m. ET/5:00 p.m. PT. They were joined by breakout Mexican star Jaime Munguia (30-0, 25 KOs), who will make the second defense of his WBO Junior Middleweight World Title against rugged Canadian contender Brandon "Bad Boy" Cook (20-1, 13 KOs) in a 12-round battle.Former IBF Middleweight World Champion David Lemieux (39-4, 33 KOs) of Montreal, Canada and Irish warrior Gary "Spike" O'Sullivan (28-2, 20 KOs) of Cork, Ireland will go head-to-head in a 12-round middleweight battle that has Fight of the Year candidate written all over it.Former pound-for-pound king and former four-division world champion Roman "Chocolatito" Gonzalez (46-2, 38 KOs) of Managua, Nicaragua will make his highly anticipated return against experienced Mexican warrior Moises "Moi" Fuentes (25-5-1, 14 KOs) in a 10-round super flyweight battle that will open the HBO Pay-Per-View telecast. "I'm bothered by all the stupid things they've been saying. I don't know which one to laugh about or get angry about at this point. But their statements are all excuses for the loss they will take this Saturday. I have been using all of these statements as motivation for my fight on Saturday. I know that it can be dangerous to go in the ring with a hot head, but I have experience. I know how to use this anger in the ring intelligently. I'm happy for all the support the fans give me, and I will give them a great fight this Saturday." "Mexican Independence Day is a huge day for boxing and boxing fans. I am a professional. I am not nervous but I am very excited to be able to defend my titles on a major Mexican national holiday for the third consecutive time. My Mexican fans like true fighters and true heroes. This may be a rematch but it is a different story, a better story, a bigger story. This fight is the biggest level for me, 100%. I am healthy and strong. I had my best training camp. I have the fight I want against the fighter I want and on the biggest stage. Why shouldn't I be happy? If Canelo gives me a chance and fights like he claims he will, I will knock him out. It is time for the Big Drama Show." "I'm very happy for the support that I'm getting from the fans. I feel they are drawn to me because of my style of fighting and because they know I like to give a great show to the fans. Right now, it's just about maintaining weight and preparing for the weigh-in. I know Cook is tough and difficult fighter, but you're going to see a more relaxed and concentrated Jaime Munguia this Saturday." "It's a dream come true for me. Two fights had gotten cancelled. This is a huge opportunity for my team. I didn't come here to get paid, I came here to fight. Munguia's tough. I was running this morning, and I saw him running, so I know he's preparing well. This is one of the toughest challenges of my life. I can't thank Golden Boy enough. This is it, and I can't wait.I know he's ready, I'm ready. I'm going to be his toughest opponent to date." "I'm excited for Saturday night. I promise you some fireworks. I hope everyone enjoys the show. He has a big mouth. He likes to talk garbage on social media. He's not the best kind of guy. I'm going to knock him out and make a lot of people happy. I'm at 100% right now. You're going to see David Lemieux who is at his best this Saturday." "It means a great deal for me. It took me eight years to get here. I'm more ready than I've ever been before. He's going to be cooked. He's very one dimensional. He does the same thing over and over again. He says the same stuff over and over again. I'm going to teach him a lesson on Saturday night. I'm a very hard worker, I've been a hard worker my whole life. I fight like a Mexican.Watch out David, you're getting knocked out." "I thank God for this opportunity. This is exactly what I have been praying for. I'm ready to make my comeback against this tough opponent. I will show the world I can still be a world champion." $5,000, $2,500, $2,000, $1,500, $800, $700, and $500 not including applicable service charges and taxes. There will be a limit of eight (8) per person at the $5,000, $2,500, $2,000, $1,500, $800, $700 and $500 price levels. To charge by phone with a major credit card, call 888-9-AXS-TIX (888-929-7849). Tickets are also available for purchase at www.t-mobilearena.com or www.axs.com.